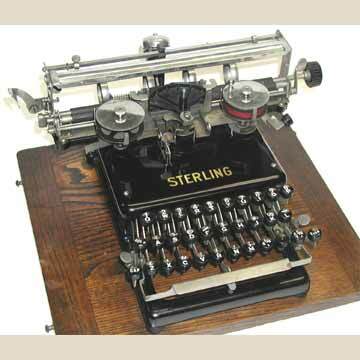 The Sterling typewriter was a three-row swinging sector typewriter, developed by C.J. Paulson. The machine was produced originally as the Secretary and Eagle and reintroduced in 1911 as the Sterling. The principle of the Sterling is very similar to that of the Hammond, with a single type element swinging around a vertical rod (see pic 6). The machine was not successful and in 1911 a second, somewhat sturdier version appeared that also failed. Very rare. Read more details in the book TYPEWRITER, page 169.